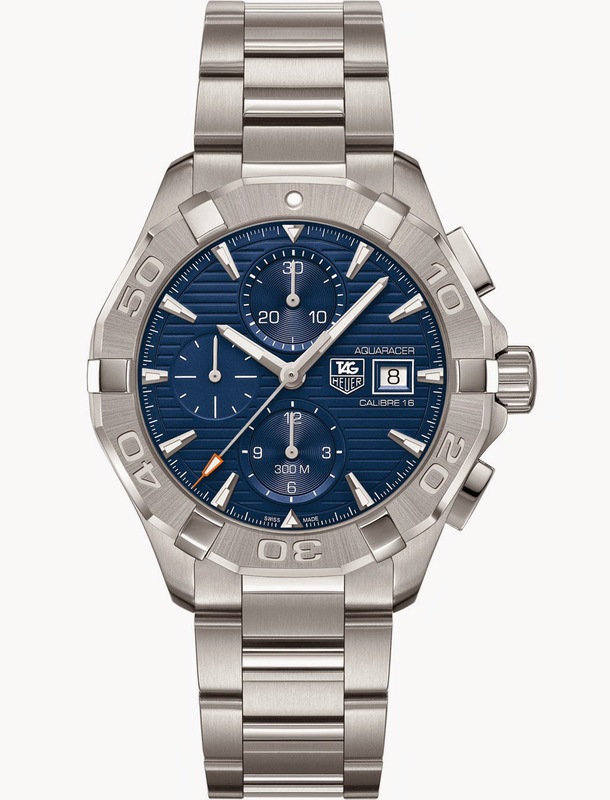 After the introduction of the Tag Heuer Aquaracer 300m Calibre 5 with new case, bezel and dial, Tag Heuer also updates the chronograph model and launches the Aquaracer 300m Calibre 16 Chronograph. The satin-brushed and polished stainless steel case has a diameter of 43mm and offers water resistance to 300 metres. 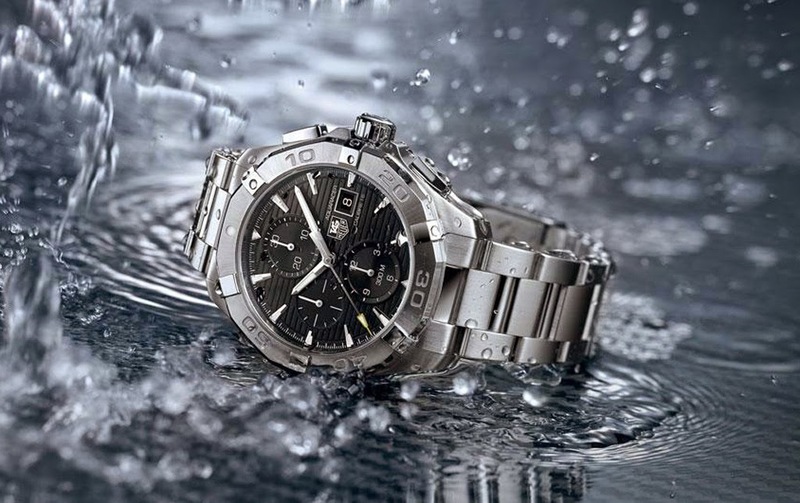 The restyling of the Aquaracer is characterised by a new unidirectional rotating bezel: it is now flat at the bottom rather than pointed and numbers are engraved and not black-lacquered. The case houses the Tag Heuer calibre 16 automatic movement beating at 28,800 vibrations per hour with a power reserve of 42 hours. It has Côtes de Genève finishing and an engraved rotor. The dial features a horizontal streak pattern with thick hour and minutes hands. Hands and hour markers, just like the bezel dot at 12 o'clock, are treated with luminescent material. Also the central chronograph seconds hand has a triangle-shaped luminescent tip for improved visibility even with poor light conditions. The minute and hour chronograph counters, positioned at 12 o'clock and 6 o'clock respectively, differ from the running second counter at 9 o’clock for their 'azurage' patterning which makes easier to quickly distinguish them. 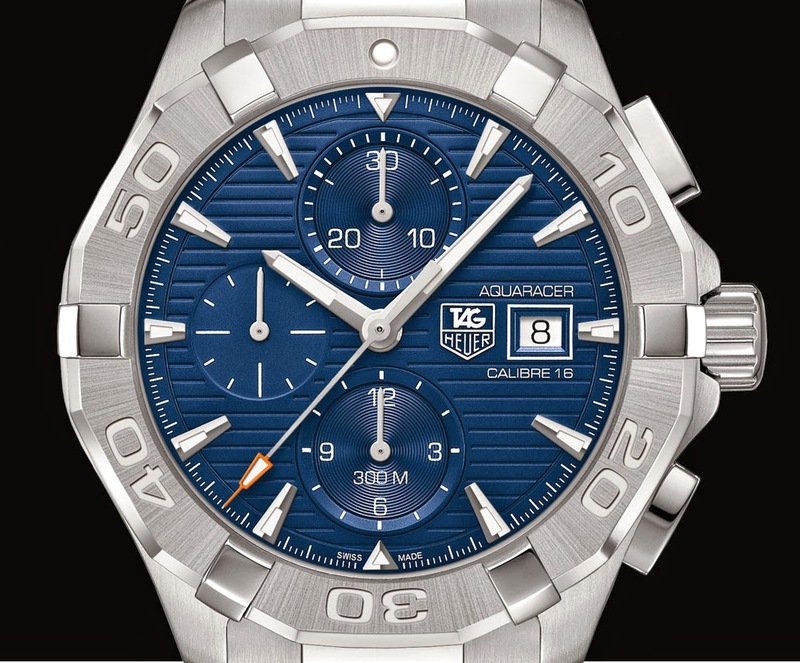 Basel 2015: Tag Heuer Aquaracer 300m Calibre 16 Chronograph. Basel 2015; Baselworld 2015. 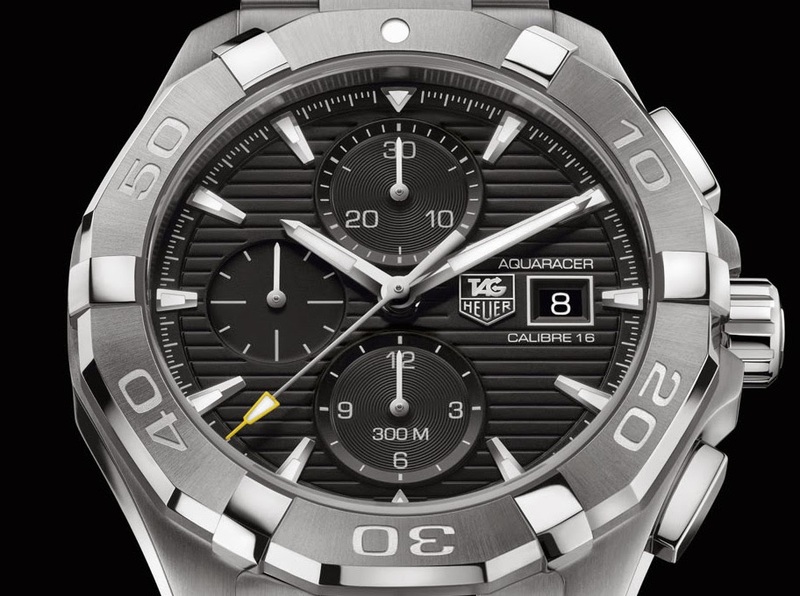 After the introduction of the Tag Heuer Aquaracer 300m Calibre 5 with new case, bezel and dial, Tag Heuer also updates the chronograph model and launches the Aquaracer 300m Calibre 16 Chronograph. Available with a black (ref. CAY2110) or a blue (ref. CAY2112) dial, the Tag Heuer Aquaracer 300m Calibre 16 Chronograph comes on a stainless steel bracelet.